Files with atl file extension can be mainly found as diagnostic logs generate by car control units. These are used by car mechanics to check the results of car diagnostic. 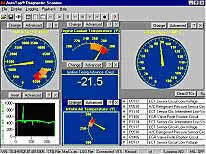 The atl file extension is associated with the AutoTap, an application for Microsoft Windows that allows car mechanics to check diagnostic of cars through CAN bus. The atl file stores diagnostic log created from car control unit. AutoTap is a complete coimputer solution for car diagnostic. Use AutoTap to work with *.atl files. Programs supporting the exension atl on the main platforms Windows, Mac, Linux or mobile. Click on the link to get more information about AutoTap for open atl file action. Programs supporting the exension atl on the main platforms Windows, Mac, Linux or mobile. Click on the link to get more information about AutoTap for create atl file action. Click on the software link for more information about AutoTap. AutoTap uses atl file type for its internal purposes and/or also by different way than common edit or open file actions (eg. to install/execute/support an application itself, to store application or user data, configure program etc. ).